Brittney was our day of coordinator and we seriously couldn't have done it without her. 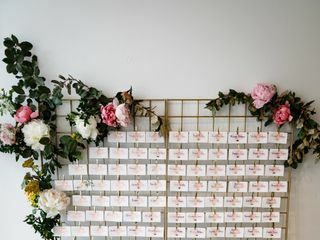 We were working with a wedding-factory type venue that just wanted us to fit their mold and Brittney helped us create our own special day in that venue. She came to the venue a month before the event to figure out all the logistical details with us and the caterer. Then she set up a bunch of spreadsheets for us to organize all the details. On the day of, she showed up and set everything and everyone straight, coordinating many details and keeping everyone calm and on task. She was my calm in the storm. As a former doula, her work reminded me of the job of a doula in a birth. She was there with us from start to finish and really was our rock! When I was stressed and confused, I said, "Brittney will handle it," and referred everyone to her. Hiring her was definitely the right choice! Shifra, I loved working with you and Eric. Your day represented you two as a couple perfectly and glad it was everything you expected. I'm so glad to be part of your day so you could relax and enjoy yourself. Such a special celebration! Brittney was delightful and thoroughly helpful and competent planner. Responsive and friendly and indispensable for us in organizing our event. Highly recommended! Thanks, Frank! It was wonderful working with you and your lovely family. It was such a special night filled with love! 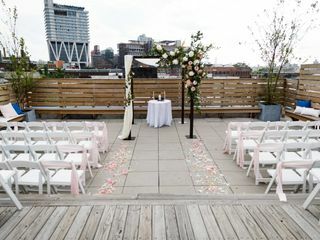 My husband and I were very excited when we booked our venue. However, it was basically a blank space and I quickly became overwhelmed by everything I would need to do. My friend suggested I look into a wedding planner. I found Brittney on my venues instagram page where she was tagged in a beautiful ceremony picture. I knew after the first phone call with Brittney that she was the one. She has such a warm and jovial personality. She is very attentive and has impeccable attention to detail - with both planning and listening to requests. Instead of being stressed out, I actually enjoyed planning my wedding and that was because of Brittney. Tara, the coordinator, was also present in the planning and was a true professional the day of the wedding. She was calm, collected, and organized which in turn made me feel confident and relaxed which is saying a lot when its your wedding day. The wedding was amazing and was executed exactly how we envisioned it. I would recommend Brittney and her team to anyone and I want to plan a party again just as an excuse to work with Brittney again! Hailey, thanks for all of your kind, thoughtful words! I'm glad to hear I was able to put you at ease and make the process enjoyable. It's so important to enjoy the planning process leading up to the big day! I'm so happy to hear Tara's execution was also professional and calming. Thanks so much for allowing us to be part of your planning and wedding day! We entered a raffle at a wedding expo and won Brittney’s day of services which was a nice thing to have because I probably wouldn’t have thought to obtain a day of coordinator otherwise. Brittney is easygoing, professional, friendly and accommodating. We began communication almost immediately and she was happy to assist me in answering questions or bouncing off ideas as the wedding got closer. About a month out she scheduled a venue walkthrough and knew all the right questions to ask. She did a great job of taking our interests into consideration and maintaining our vibe. The day of the wedding I scheduled her to come around 4pm which was my mistake-if you are going with a day of coordinator I recommend having them meet you while you’re getting ready as the bulk of the issues come up at that time, there is just so much to focus on. Brittney did a great job of setting up the venue and maintaining the flow of the event, she listened to my many requests and executed them very well the day of the wedding. We had some problems come up with some of our rowdy guests and Brittney handled it seamlessly and quietly-even though they were very difficult. She also dropped us a little note to say thanks in our card box which I thought was such a sweet sentiment! Thanks so much for your thoughtful words! I'm glad we were able to work together and help execute your beautiful wedding. Happy to be part of your day! Brittney was a rockstar day-of-coordinator. With limited time to go over the day-of-plans, we were impressed with how easy and effortless she made us feel before, during and after the wedding. It helped tremendously that she was already very familiar with our venue and really has the experience and know-how. We highly recommend Brittney and couldn't have gotten through the day and weeks leading up without her! Hannah! Your words are too kind. Working with you and Scott was such a joy. I'm so thankful that I was part of your day and help things run smoothly. We were apprehensive at first about investing in a day of coordinator because we were already anxious about keeping an eye on our budget and being mindful to not overdo things. That said, my now husband says that of all the vendors we used, Brittney was the one who was worth every penny. We had a very complicated wedding scenario (a raw space without a kitchen so there were a lot of logistics to work around), but Brittney handled everything. She was always so nice via phone, email, and text. I would re-hire her in a heartbeat. She consistently checked in with us ahead of the wedding and made us feel so much more prepared for the big day. Thank you Brittney! Allison, I loved working with you and Andy and your words are too kind. Your wedding was so much fun and in such a cool venue! I'm happy to have been part of it. 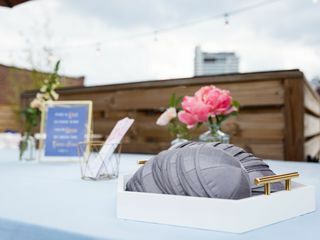 At first, I was a bit hesitant to hire a day of coordinator since I've planned and coordinated a number of events that were bigger in size than our wedding, but hiring Brittney was hands down one of the best decisions we made when it came to our wedding. From a month out she helped to keep everything on track. We loved how Brittney was flexible with us, doing a walkthrough of the venue just a few days before the event even though she had already worked weddings there, being open to picking up our wedding favours and cupcakes the day of, and even swinging by our hotel to get the rest of our decor. Having Brittney manage the logistics of our day meant we got to enjoy everything and avoid all the awkward conversations with vendors. Beyond keeping things on track, Brittney kept an eye on us - and even put together a dessert plate for both of us because we had gotten too caught up in conversation. Perhaps that is something a relative or friend could do, but it was nice to know we had someone looking out for us so everyone could just focus on having a good time. Highly recommend BLB for DOC. Emily! I loved your sweet and intimate wedding at Frankies. I'm so glad you were able to focus on enjoying your time with your family and friends especially after traveling so far. It was a joy to work with you. Brittney is one of the best! 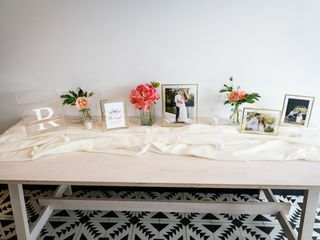 Brittney was a wonderful planner to collaborate not with on Wedding Wire's corporate networking event this past summer. She was not only extremely professional but also incredibly down to earth, easygoing and approached her role with a sense of humor. She had a wonderful idea of using colored pots for potted plants we provided throughout the space and it gave the event a really cute, creative touch! I highly recommend her for planning and day-of-coordination. Brittney is a great wedding planner, and we were so lucky to work with her! 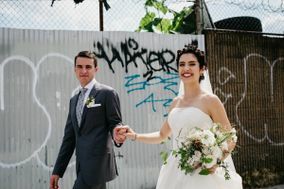 My now-husband and I knew that we wanted a wedding in a raw-space venue, filled with personal touches that would reflect who we are as a couple. Little did we know that personal touches are a ton of work, and we couldn't have done it without Brittney. She was there for us every step of the way. Brittney's down-to-earth personality, great listening skills, and fast responsiveness made it very easy to work with her. She is extremely organized and helped keep us on track when it came to the wedding planning timeline and budget. Brittney was amazing at communicating with all of our wedding vendors, and tried her best to make herself available for every walkthrough, phone call and vendor meeting. Our wedding was truly a vision come to life. Everything went very smoothly with a couple of minor hiccups along the way, which Brittney was able to fix effortlessly. Go figure that a ketubah can go missing, but Brittney was able to save the day! Anna and Simon! I don't know where to begin. I loved working with you and help create your BEAUTIFUL wedding. It was fun working with you both through the months. I still can't believe how personal and stunning it was. Thanks so much for your kind words!! We hired Brittney as a day of coordinator. This was the best decision we could have made. She was easy to work with, professional, organized, and made everything go incredibly smoothly. I didn't have to worry about a thing at the wedding. Even though we hired her just for day of, she was available to answer our many questions as we went through the planning process. She is seriously the BEST! Amy, it was such a pleasure to work with you and So. Your wedding was so lovely and sweet. I'm thankful I was part of it to really make it relaxing and enjoyable. Coffee soon! I could not speak more highly of Brittney and BLB Events. She was the best decision I made when it came to our wedding. Brittney is so talented at listening to a couple’s vision for their day, understanding it, and translating it into reality. From our first interaction, through the venue walk-through, through our wedding day, Brittney was an invaluable resource. She recommended amazing vendors, shared creative ideas, and kept our planning on track with regular check-ins. On the day of our wedding, she was an absolute magician. She was punctual, polished, organized, and absolutely unflappable throughout the evening. If anything went wrong or there were any challenges, we were completely unaware and she handled everything with tact. Having her there allowed us to feel entirely relaxed and truly enjoy the evening worry-free. Brittney set out all of our décor (she has an incredible eye for design) and she organized and distributed it for removal at the end of the evening. She managed all the vendors and logistics that go along with that, including personally adjusting the dinner music when it was too loud and our DJ was nowhere to be found. She thought of every detail. So many guests commented on how smoothly each phase of the evening ran and her work in general – For instance, we didn’t have any announcements telling guests to move to cocktail hour or into the ballroom for dinner, or downstairs for dancing. Brittney made sure it happened cleanly and efficiently. No one felt rushed and feeling like our evening didn’t fly by in a blur is entirely due to Brittney managing everything so elegantly. I’m not sure that this review even does justice to the incredible work she did – she is exceptional and an overall lovely person to boot. Meridith!!! You have so many kinds words that I can't thank you enough for them. Working with you was wonderful and your wedding day was so special. I'm happy to hear you were relaxed and enjoyed your day so much. Thank you for letting me be part of it. I hired her and her assistant Tara as my DOC, and boy was she good! I planned my entire 140 guest wedding on my own, but as the day was coming closer I just knew I needed to get someone's help. After searching several coordinators, Brittney was professional, responsive, flexible, and organized. She kept in touch with me as I was running around all crazy preparing, and sent over ideas as well. The big day went perfectly thanks to her! She was calm and collected the whole time--I don't know how! Having planned everything myself and falling under stress, there were a lot of minor details that I'd completely missed, but she ALWAYS caught them and let me know, and was even able to find alternatives for them. She checked in often and kept us on time, and organized everything during cleanup as well. Iliana, you're too sweet. Your wedding was beautiful! Tara and I enjoyed being a part of it and making the day go smooth while you got to relax and enjoy yourself! Our wedding day would not have been the same without Brittney! We relied on Brittney to create a day-of timeline and to execute and oversee our venue decor plan. She was super responsive in the lead up to crunch time and even proactively reached out with ideas and questions. She seamlessly kept everything running smoothly on our day-of and I was felt completely comfortable putting the day's timeline and decor execution (which was huge!) into her capable hands. Brittney's also got a great attitude, genuinely cares about the couples she works with, and just "gets it." I highly recommend working with her for your Big Day! Madeline, I loved working with you and Matt! And I'm happy to hear I made you feel at ease on your wedding. Your decor diagram is still one of my favorites :) Your wedding was beautiful and filled with so many lovely people. Brittney is professional with a caring touch. We never felt like just clients but someone she knew since childhood. We had a very distinct vision for our wedding and Brittany was able to accommodate all of our needs with love and attention. She adjusted to our needs and helped us see our vision through. We cannot thank Brittney enough for what she done for us. If you are getting married, looking for perfect wedding, you have to go with BLB event! Xiaoran!! I LOVED working with you and helping your vision come to life. Your wedding was absolutely stunning and truly enjoyed working with and curating your entire vendor team. I'm so thankful we got to know each other over those months!! From day one, we hit it off! Brittney was an absolute dream to work with! She was organized and responsive which is exactly what you want in a planner. Brittney brought together talented vendors to create a magical wedding for our client. They had a very specific vision in mind and she made that come to life. I would highly recommend Brittney to anyone who is recently engaged! Brittney is absolutely phenomenal! She was our Day-Of coordinator and was a rock in the planning process for the last few months. Brittney is pleasant to be with, kind, thoughtful, knows her stuff, and kept us moving and focused. She is highly responsive too. Could not have been happier and am already recommending her to our friends who are newly engaged. Brittney was fabulous to work with from start to finish! She is responsive, kind, and went above and beyond. I was grateful to have Brittney to bounce ideas off of and keep me sane throughout wedding planning. She was a rock-star with managing the day of timeline, and made sure everyone was where they needed to be when. 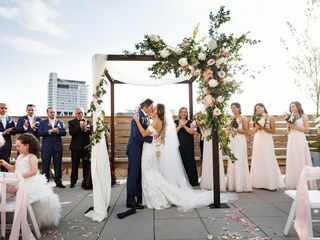 Brittney is also flexible with your planning needs - I had a unique request to help with a recessional walk from the church through Central Park to the Boathouse and she gladly took on the task, learning the route and making sure guests made it to the reception. Brittney is organized and an all around great person - I highly recommend her! Wonderful experience with Brittney of BLB Events! She made our entire planning process and day of go smoothly. Highly recommend using her for your future event! We absolutely recommend Brittney and her wedding services. She's the sweetest, most efficient , professional and highly dependable to get the job the done. We loved our wedding day and would not change a single moment of it. 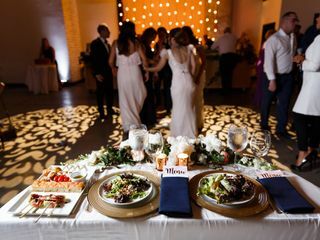 Hiring BLB Events was literally the BEST decision that we made for our wedding! We were accommodating more than 300 guests and the day went without a hitch! Brittney LISTENED to everything that we asked for and helped bring together ALL of our ideas and sporadic requests. She offers great ideas and more than delivered on her promises. Even our other vendors raved about working with her. We cannot thank her enough. 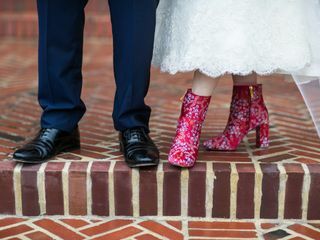 If you're in the market for a wedding planner or day of coordinator, I cannot believe that there could be anyone more flexible and effective at the job. You will not be disappointed! I just had to come back to say more... As we look back at all the planning that was done before the wedding up until the very last minute of our wedding reception, I can't stress ENOUGH that booking Brittney was the best decision we made for our wedding. Even months after our wedding, our guests would tell us how SMOOTH everything went.. that basically nothing went wrong. And all we can say/think is Brittney is just THE BEST at what she does. I'm sure it was probably madness behind the scenes, but we as a couple on that day did not notice anything. We were able to soak it all in and enjoy our special day.. all thanks to Brittney! She's also the easiest person to talk to/share ideas with. She is super grounded and down-to-earth, which is exactly what you need in a wedding planner. And if at times I was stressed, she was ALWAYS there to listen, calm me down, and take on more than we asked from her. Professionally, Brittney is a talented wedding coordinator. From first contact to the after-party, she was organized, effective, and completely trustworthy. After getting to know her during our month-of calls and meetings, we didn't think twice about any of the day-of details under her care... she knows exactly what needs to be done, and gets it done. And then some. She is fully equipped to solve problems independently, or to collaborate effectively across all the other other vendors. With so many moving pieces in a a wedding, you want someone like Brittney to keep everything moving smoothly. Also, as complete wedding novices, my husband and I really appreciated her willingness to offer candid advice when needed. On a personal note, Brittney is a grounded, genuine person. Remember that your coordinator will in charge of navigating you forward through some of the most emotional moments of your life. Brittney was a completely welcome presence. She keeps the event on track logistically and for the guests, while always remaining sensitive to your needs as a couple or individual. She is just an all-around awesome person. We are incredibly grateful for Brittney! We hired her to help with day of coordination and she exceeded our expectations. Our wedding was primarily DIY, which as you can imagine, requires organization and attention to detail. Brittney ensured everything we envisioned was delivered and executed and her energy was vibrant - what more can you ask for?! She truly made the biggest, and what could have been the most stressful day of our lives, seamlessly beautiful and memorable. Thank you Brittney, we appreciate you.